Found one file extension association related to Miinoto and 1 file format developed specifically for use with Miinoto. 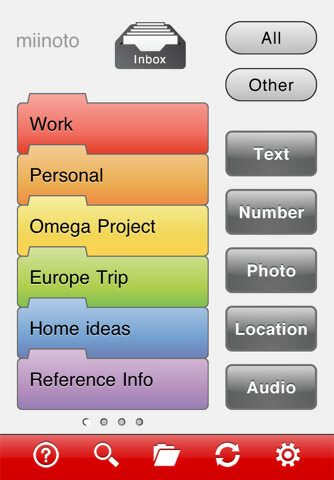 Miinoto is organizing application for Apple iPhone. With Miinoto, all your notes, to-dos and files are in the one place, available where and when you need them in a simple and elegant format. Take the worry out of keeping track of your important information. With miinoto, all your notes, to-dos and files are in the one place, available where and when you need them in a simple and elegant format. The Miinoto software seems to be old or discontinued. If you need more information please contact the developers of Miinoto (Mobiiko), or check out their product website.